One member of the Cubs lineup was the best hitter at his position in the entire league in the first half of the season. It wasn’t Kris Bryant, although he was close to the top: Justin Turner, Jose Ramirez and Anthony Rendon have all been very good. It wasn’t Anthony Rizzo, who didn’t even crack the top ten at first base. It also wasn’t a player who was actually on the team at the time, so perhaps that was a trick question, but the fact remains that Alex Avila was the top offensive catcher in the league in the first half. Now he has to replace the catcher who holds the top spot since the break, Willson Contreras. Of course, the heights Avila can reach may not be apparent to anyone who first saw him play in July, when he had a .448 OPS. 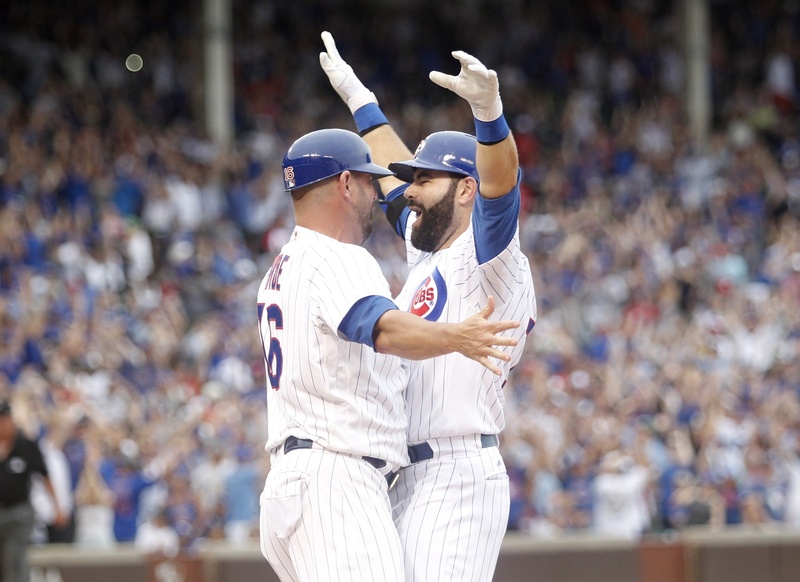 After hitting .299/.423/.535 prior to the break, the 30-year-old has slashed .203/.309/.348, although a recent flurry of production for the Cubs has significantly improved that latter slash line from even a week ago. With Contreras going down for multiple weeks, duties behind the plate look set to be handled by Avila and recent waiver claim Rene Rivera, with Victor Caratini sent back to the minors. So what might the Cubs expect from Avila going forwards, and how much can he compensate for the absence of Contreras? There is one part of Avila’s game that can always be counted on: walks. He has never had a walk rate in the single digits in any of his professional seasons. In fact, since Avila’s debut season of 2009, he ranks 15th amongst all MLB hitters (6th active) with at least 1000 plate appearances with a 13.9 percent career walk rate, right behind Bryce Harper and just ahead of Mike Trout, which is not a position many players hold on any leaderboard. The walk rate is tied to Avila’s refusal to swing at anything not in the zone, chasing just 20.4 percent of pitches outside in that same period, good for 14th on the list. Since the start of the 2015 season, the long-time Tigers backstop has taken even that to the extreme, ranking first among all hitters with at least 400 PA, and it’s not even close, with an O-Swing% of just 15.3 percent. That’s an incredible 3.5 percent lower than perhaps the game’s finest example of an elite approach at the plate, Joey Votto. This all sounds great. At this stage, readers might be thinking that the surprise isn’t Avila’s excellent first half, but the fact that he isn’t routinely that good. After all, when the names Harper, Trout, and Votto are invoked in a positive comparison, one has to assume that one of the very best offensive talents is involved. However, one thing sets Avila apart from our other elite plate discipline names: contact. Here are some other names. Keon Broxton. Mike Zunino. Chris (and Khris) Davis. Are you thinking about strikeouts and home runs? Those are the names around Avila at the top (or bottom) of the contact rate leaderboard over that same period, since the start of 2015, when he has been the league’s best at not chasing after balls. Avila’s contact percentage over that time is just 65.7 percent, the third-lowest mark in the league. He doesn’t have a strikeout rate commensurate with such a poor contact percentage because of that discipline: his 27.8 percent strikeout rate over that time is high, but just 38th on the list, a long way behind the likes of Zunino (33.4 percent). Avila used to make contact. Not Juan Pierre levels of contact, but middle-of-the-pack, entirely respectable levels of contact. He hovered in the mid-70s for contact percentage and mid-80s on pitches in the zone. He used to chase a little more often, as we’ve seen, but still at incredibly low levels. In 2011 he hit .295 with 19 home runs in 551 PA, which was comfortably the high point of his career prior to 2017. Then Avila seemed to lose the ability to hit the ball in the air and with it went his offensive value. His ISO dropped almost 70 points to .142 and didn’t get back above .150 until last season with the White Sox, when he also struck out 37.3 percent of the time. That contact rate nosedived, dropping every single year of his career to a career low of 65 percent in 2016. Avila still walked, because he still didn’t start chasing, but with only around 30 percent of his batted balls hit in the air, and a litany of leg injuries and concussions interrupting his playing time, nothing else was working. Between 2011 and this season, 11 was his highest home run total, and .243 comfortably his best batting average. Did anything change to spark the 2017 outburst? Avila himself says he hasn’t tweaked his approach, so a significant change in that regard seems unlikely. The health is certainly likely to be a factor, and thus far Avila hasn’t struggled with anything that has affected his legs, and consequently his power. The below clips are both at Target Field, the top from 2015 and the bottom from 2017. There doesn’t seem to be a huge difference, but Avila is a little more closed off in the lower clip: he’s turned away from the pitcher slightly more, possibly keeping his hands back, and that might be what’s helping him to wait on pitches and lift them in the air instead of getting out in front of them and pulling grounders. Avila has also become even more selective on pitches in the zone in addition to swinging less than ever at pitches outside the zone. His 60.1 percent zone swing rate is lower than average but isn’t particularly notable relative to the league, yet it’s almost five points lower than his 2016 rate and comfortably a career low. It’s also a good thing that Avila doesn’t chase pitches outside the zone, because he is terrible at making contact with them when he does: at 34.4 percent, he does so less often than any other player in baseball. His plate coverage is not great, and his approach has trended ever more towards leaving a ton of pitches that he can’t drive, and swinging very hard at the ones he can. Ultimately, that means Avila’s low contact rates haven’t changed. The good news is that Avila has the power to do some serious damage when he does make contact and he seems to be using that selectivity to good effect the majority of the time. Per Baseball Savant, his percentage of balls hit over 95 mph is 53.6 percent, third-best in the league behind Aaron Judge and Joey Gallo, who are considerably more well-known than Avila for hitting the ball very, very hard. It’s another area where Avila ranks among the elite names in baseball. That power plays to the opposite field, and Avila has the bat speed to wait on pitches, rarely popping up and frequently hitting blasts to left: six of his homers have been hit to left field already this season, and another two to left-center. The more hitter-friendly construction of the new baseballs may also be helping Avila, as he isn’t a Judge or Gallo with regards to routinely hitting 460-foot bombs that would get out in every park. There’s also no escaping the fact that Avila’s inability to make contact makes him prone to batting average slumps, as July demonstrated, but with the outstanding walk rate, his OBP baseline is much higher, and a healthy Avila hitting the ball in the air frequently comfortably clears the very low bar for valuable offensive catcher. He’s also a great line drive hitter, with a career rate of 24.1 percent, so when contact is made it’s frequently valuable even if it’s not a home run. Avila’s arm and blocking skills are also fine by the metrics, with nothing particularly eye-popping in either direction. He’ll have a harder time stopping the run game with the Cubs pitching staff than he did in Detroit, where he threw out 11 of 33 runners this year, but as essentially an average arm behind the plate he shouldn’t hurt, and may actually be a better option than Contreras right now. At the plate and not behind it is where Avila can make a significant difference, however, and he has the ability to make up for what Contreras was giving the Cubs offensively, albeit in a fairly different manner. Health should continue to be a concern, and the last few years have shown how much Avila’s bat can be affected when those injuries are bothering him. Avila has a couple of offensive skills that rank among the very best in baseball, and a ton of swing-and-miss that can make his performance more volatile than that of the elite names he ranks among in other categories. When the health is there and the approach is right, he has the ability to perform at that elite level for stretches. The Cubs will be in great shape if the next few weeks is one of those stretches.